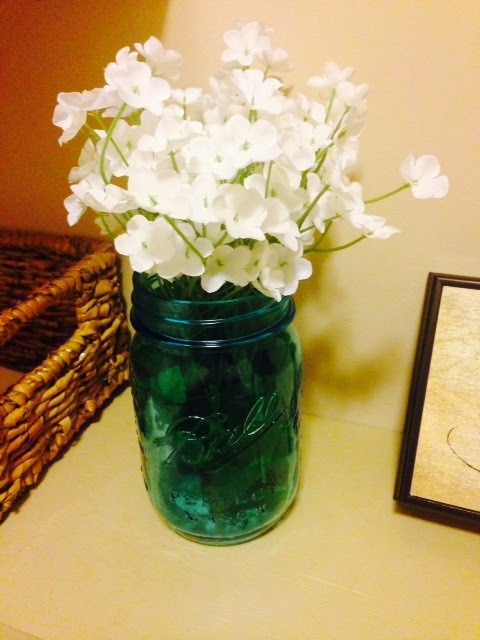 I am linking up with Tara for another round of Monday Made It! 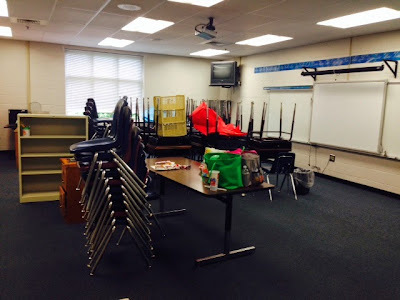 I have worked in my classroom this week, but don't have any part done enough to show that. My second Monday Made It has been a l-o-n-g process. 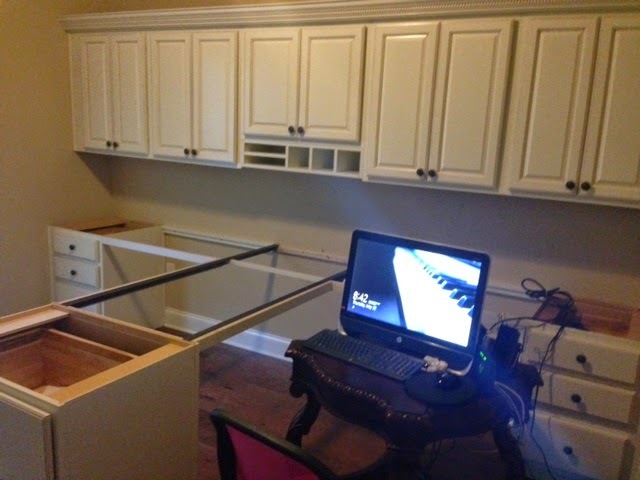 When we first moved in, we knew we wanted a nice home office. 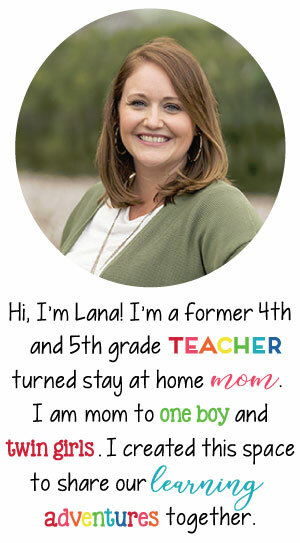 My husband works at home quite a bit and needs a space to spread out and I also could use space to work on school stuff. 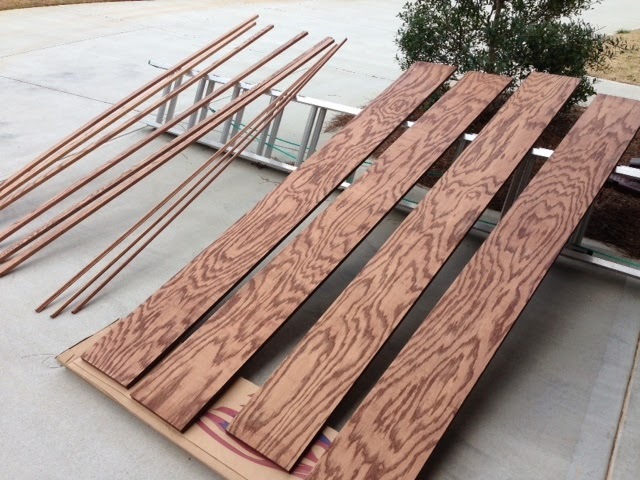 Step 3: The next step was to pick out custom cabinets. 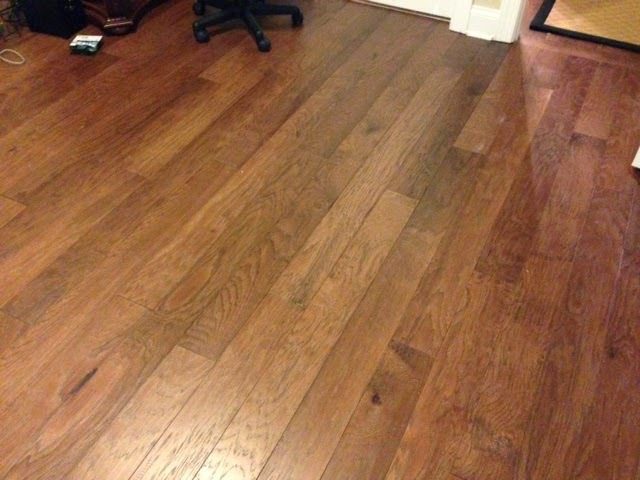 We chose to use Lowe's for this project and was overall pleased with the process. 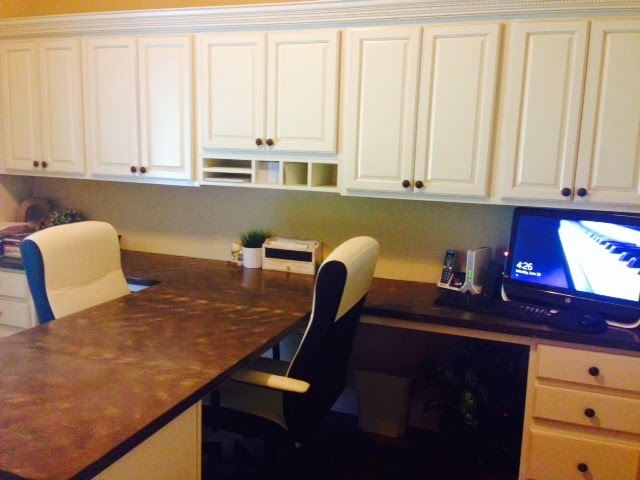 I LOVE the cabinets that they installed and have been SO happy with them! Step 4: After the cabinets were installed, we were able to have the countertop installed by Lowe's. 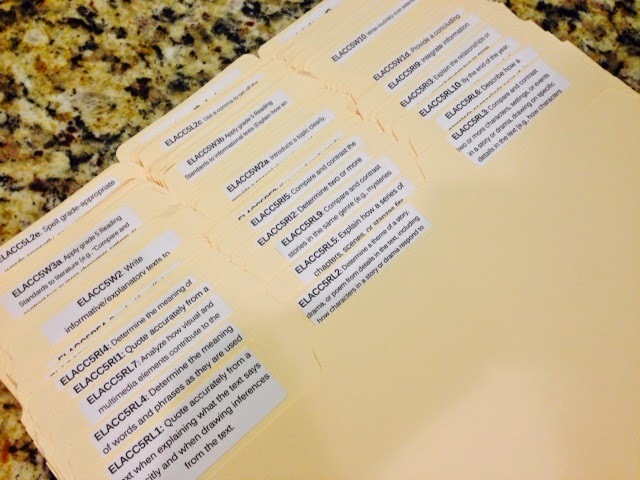 Step 5: ORGANIZE! This step was by far the worst! All of our office stuff was just thrown into boxes. We organized, organized, and organized some more. And shredded TONS of papers - 8 garbage bags worth! 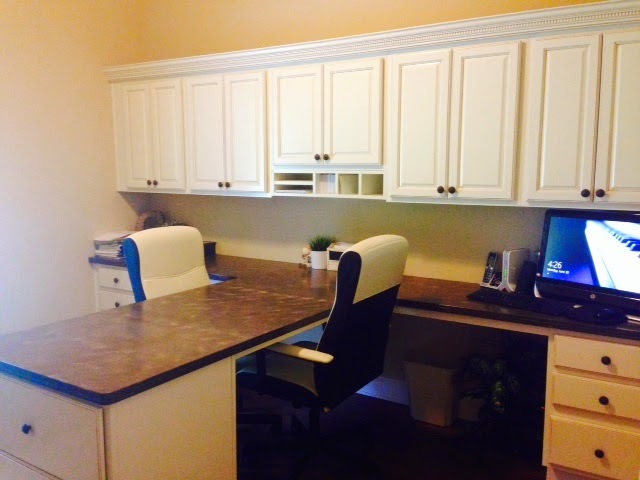 Step 6: Enjoy our new home office! I LOVE it! 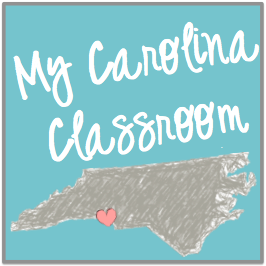 Yesterday I had the opportunity to do a guest blog at Kristin's blog, My Carolina Classroom! She has the cutest blog! 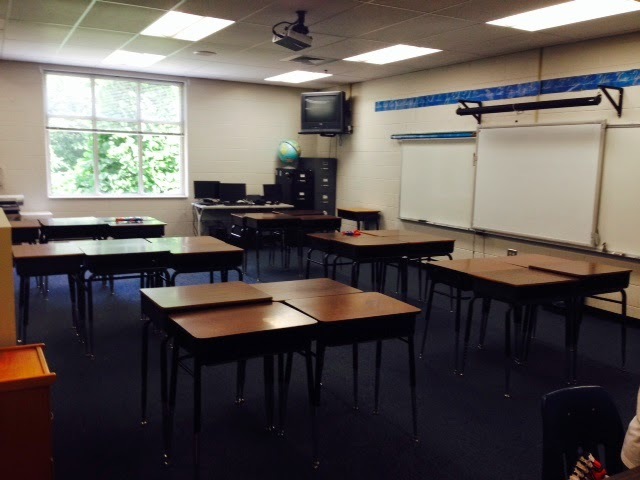 Yesterday I was able to go look at my new school and my new classroom! I was so curious to see what my new room would look like. Would it be a big mess? Would I have a lot of supplies left by the previous teacher? Would it be newer construction or older? Would there be carpet or tile? Would I have a nice window? A classroom library? 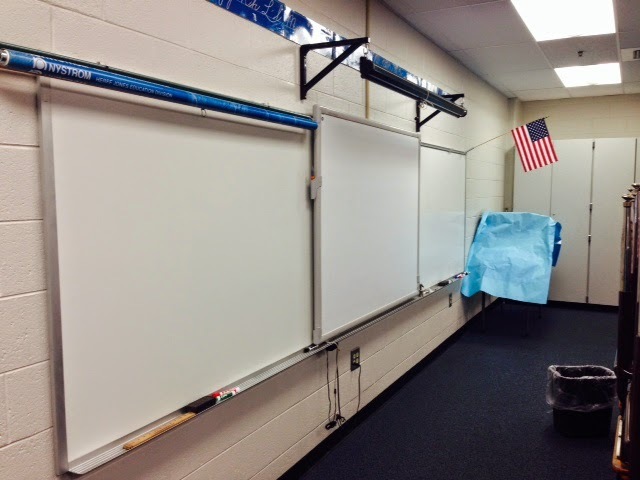 If you've ever moved classrooms or moved schools, you know all of those questions (and many more!) too well! Most of my questions were answered after looking around. Thankfully, I didn't have a big mess. It was neat and organized somewhat. I have a LOT of craft supplies left from the previous teacher, which I am very thankful for. This area of the building is newer construction. I have carpet except for an area right as you enter the room near the sink (Woohoo for having a sink!). I was very excited to see a nice big window with a beautiful view of the trees outside. No traffic - just lush vegetation as our view. 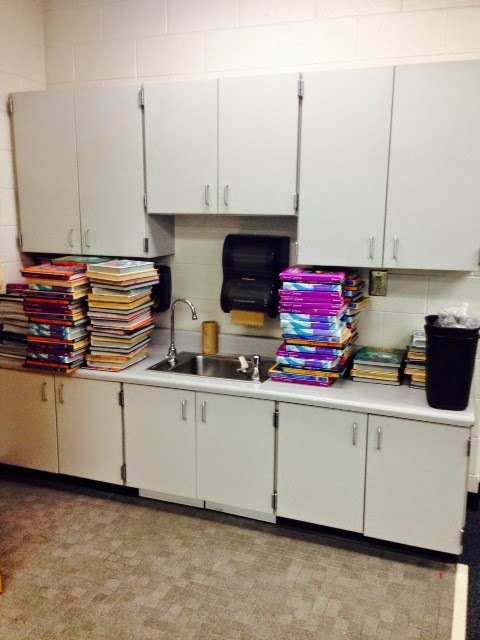 I have lots and lots of class sets of books, but basically no classroom library. There were about 5 books and another teacher gave me about 10 books. This is an area I'll be adding to by going to a local thrift shop that has lots of books. 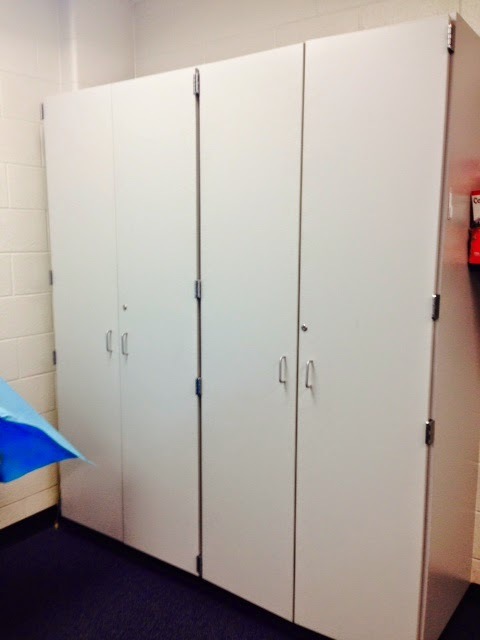 I was a little surprised to see that there wasn't any student cubbies. 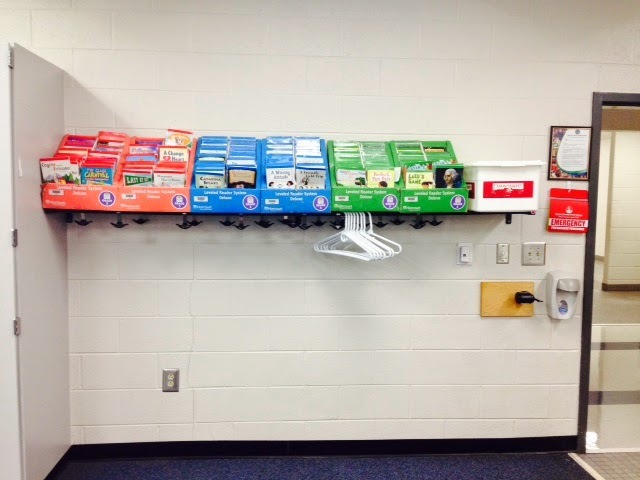 Students hang their backpacks on the hooks you see in the next photo - under the leveled books. I was really glad to see that I have a good bit of storage! This closet held class novels and lots of craft supplies. My goal yesterday was to go through EVERYTHING that was left. I was able to do this within a couple of hours. I went through all of the cabinets, drawers, etc. I also set aside an area of furniture I wanted to get rid of. I hated not using this bookshelf because it's really nice, but the only place I can see it going is in front of my nice, big window and I really didn't want to cover up that area. Instead, I'll use two shorter bookshelves that I have here at home from my previous room. 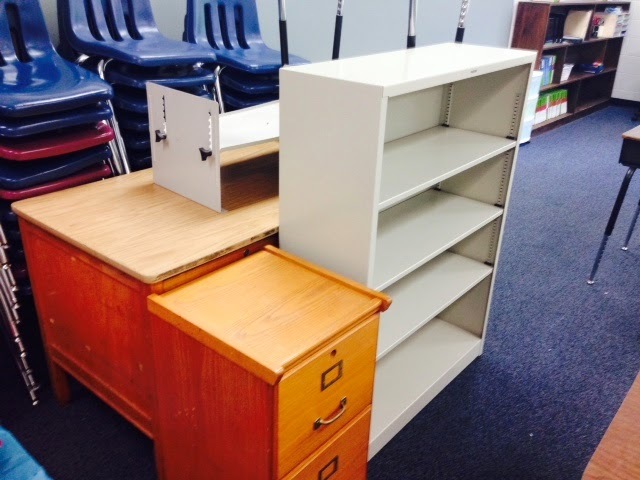 I am also getting rid of the wooden teacher's desk because I have a smaller table with my computer and a huge bookshelf behind it that I can use. I didn't really see a need in keeping the wooden desk. I also got rid of the small wooden cabinet. 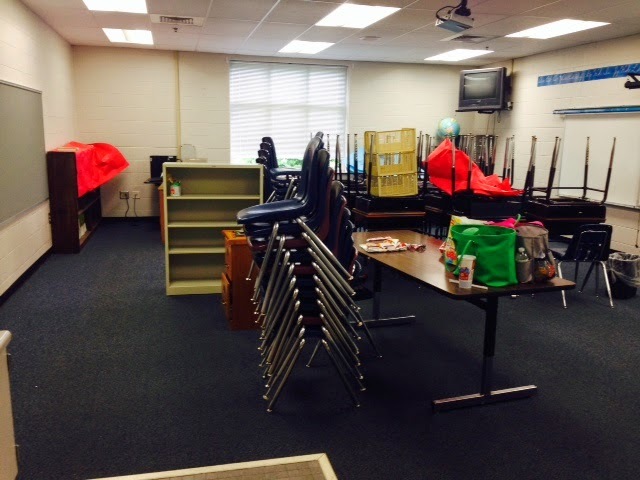 I have lots of things I've accumulated over time that I think will better utilize the space in my new classroom. This room is smaller than my previous room, which is another reason I will need to maximize my space and not use items that are bulky or that I don't think I'll need. No, I am not crazy! LOL! I just know starting all over is going to take a longer amount of time than I usually spend in the classroom in the summer. Also - I don't have a key yet, so I have to go when the office is open. They are closed all next week (except Monday when I have something planned for most of the day) and then I have plans for the next 7 days, so I won't be getting back until mid July. My first day to report for new employer orientation is July 24th and then I start back the following week. So....I really don't have a ton of time! 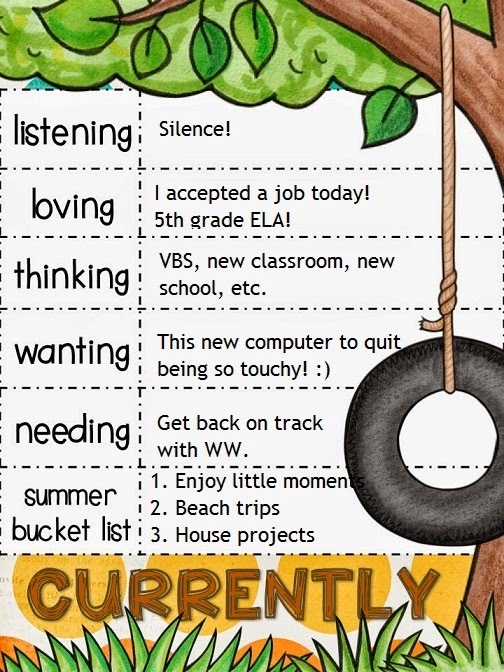 Plus - I would rather do it now and enjoy that last week of summer without feeling rushed near the beginning of school. My four year old was a PRO at school with me yesterday. I was busy working, it was HOT, but he entertained himself the entire time and didn't complain one time! I was so proud of him! It's Monday which means it's time for Tara's Monday Made It! I love the accountability that this link up gives me. If only I could get into my classroom so I can see what type of school projects I need to do. I haven't even seen my classroom or my school (besides the office for my interview) so I am just dying to get in and see what I am working with! I know most of you just got out of school so you think I'm crazy, BUT I go back July 24th! Eeeekkkk! Spark Student Motivation with the EASY button! 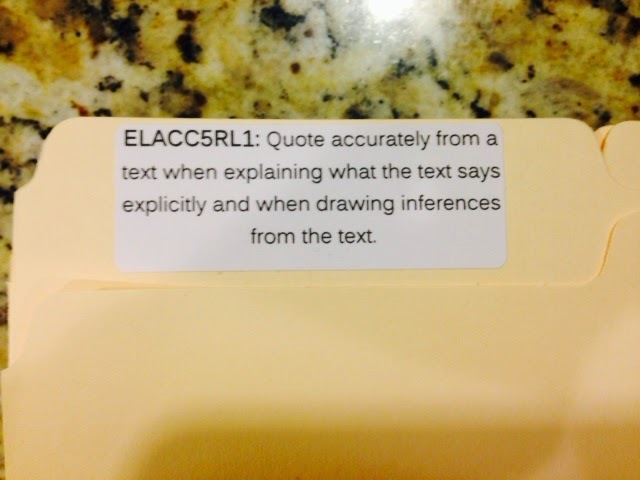 What I am sharing is actually new to me - I just bought it tonight, but I've thought about it for a while and think students any age would love it. It's one of those goofy little things, but sometimes those small things make a difference to kids. What am I talking about?! 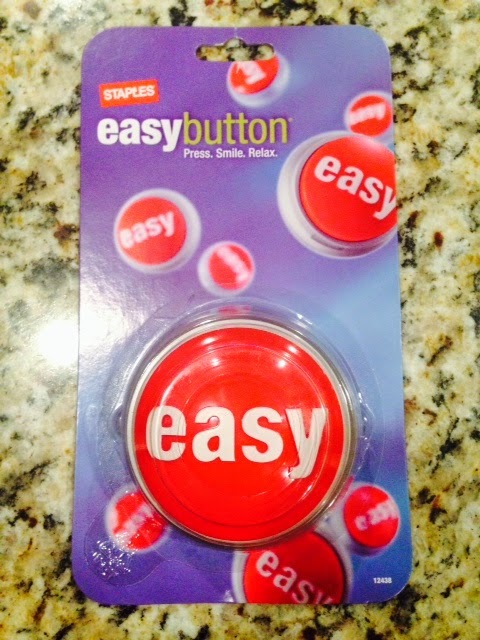 The Staples "easy" button! 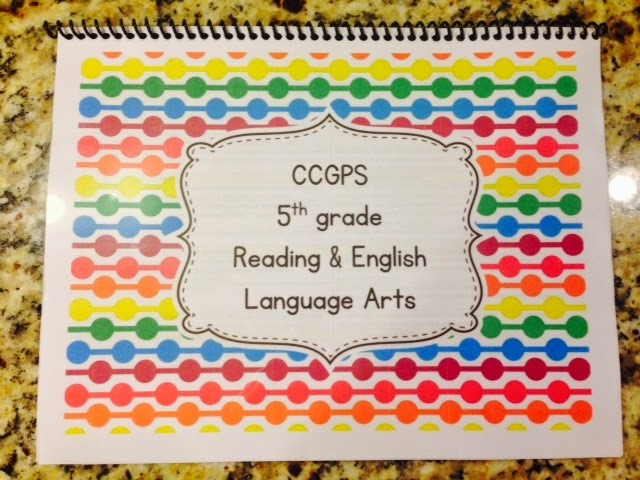 I am excited to be linking up with Tara at 4th Grade Frolics for Monday Made It! This is my first link up for this summer and all of my made it's are house related. Now that I know what I'll be teaching next year (5th grade ELA), it's time to step it up on my school Monday Made It's. The first thing I made was a new wreath for my front door. 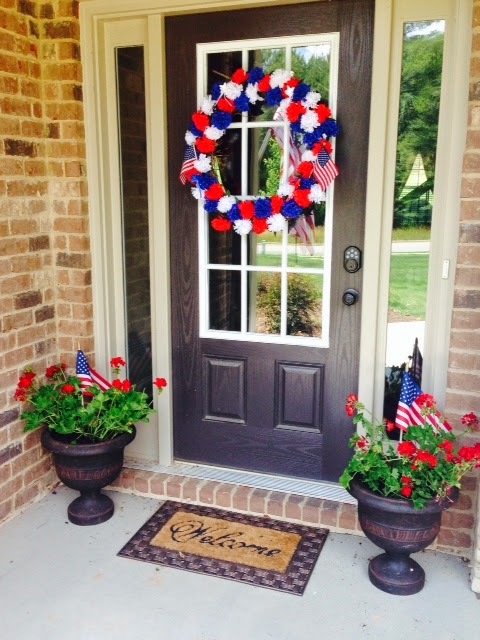 For the summer I love to have a patriotic wreath. 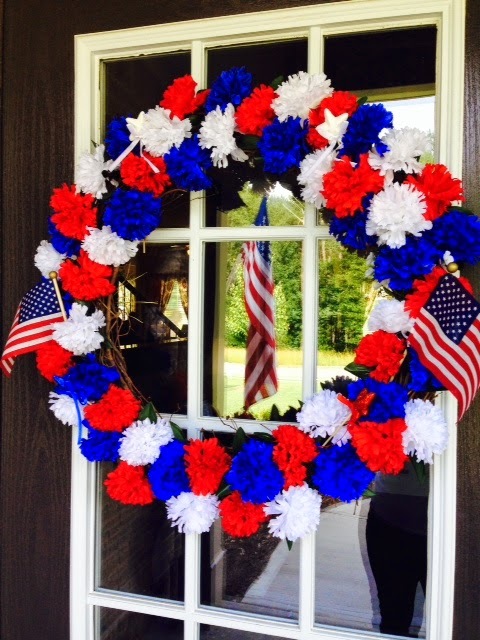 I gathered a grapevine wreath, bushes, picks, and flags to make my wreath. I love how it turned out. It is so bright - this photo is not edited at all! 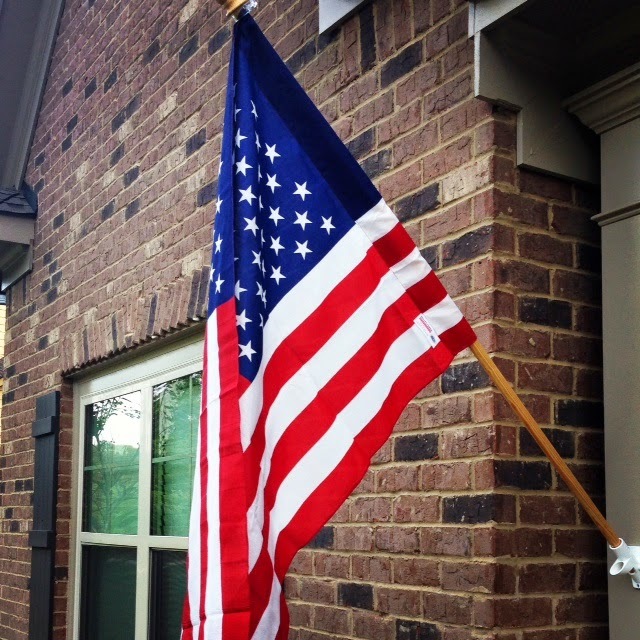 I don't know if you can consider this a made it, since we didn't actually make it, but we installed an American flag to a column in front of our house. I love how you can see the reflection of it in the wreath picture above. This past weekend I went to IKEA for the first time. It is such a neat store! It was a spur of the moment trip, so I didn't really have a plan going in. I can see now that you need a plan before going there! We got lots of cute things for our house and my favorite is this beautiful sofa table! We had planned on using it in our dining room, but decided to move it to our entry way. I love it! Now, the search is on to find new décor for it! 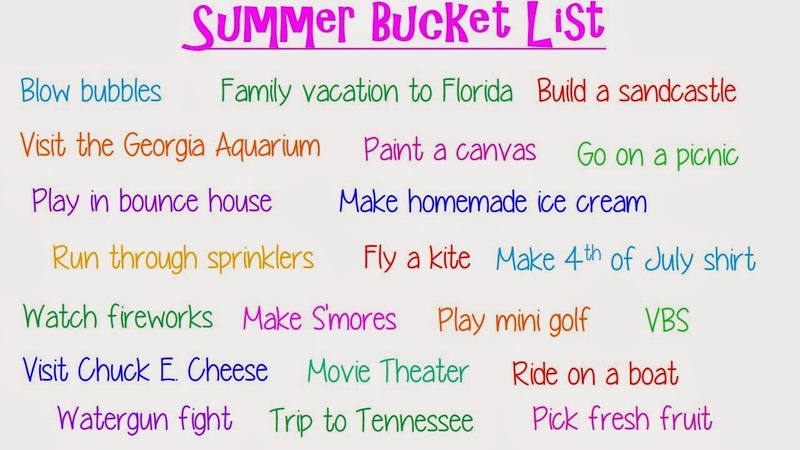 My last project was to create a Summer Bucket List of things I want our family to do this summer and create a printable of it! I am thinking I'll frame it for the summer. I looked online and found lots of Summer Bucket Lists, but I wanted to make my own with things that are feasible and things I know we'll actually do! It's not perfect, but it was a quick project last night and it will fit our needs! I accepted a job today! I had an interview last week and I left feeling like the interview went really well. I got a call that night from the principal that she was very interested in hiring me and that she would call me this week with official news. 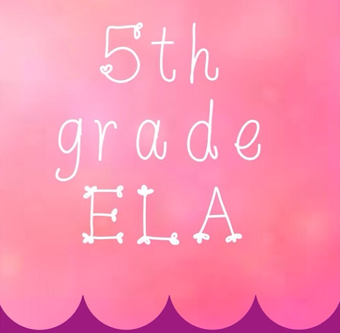 As of next year, I will be teaching 5th grade ELA! I have really prayed that God would put me where he wants me - even if that was at home for another year. It seemed that things just fell into place. Part of me hoped I could move down to younger elementary, but it didn't work out that way and that's okay. I am really looking forward to working at this school next year! Listening: SILENCE and it is wonderful! It's time for bed! Thinking: There's so much going on in my head! I am volunteering this week for VBS at my church - we have approximately 400 children and I am working with a K-1 group of 14 kiddos. I am thankful for great youth helpers. I am also thinking about my new position...What does the school look like? 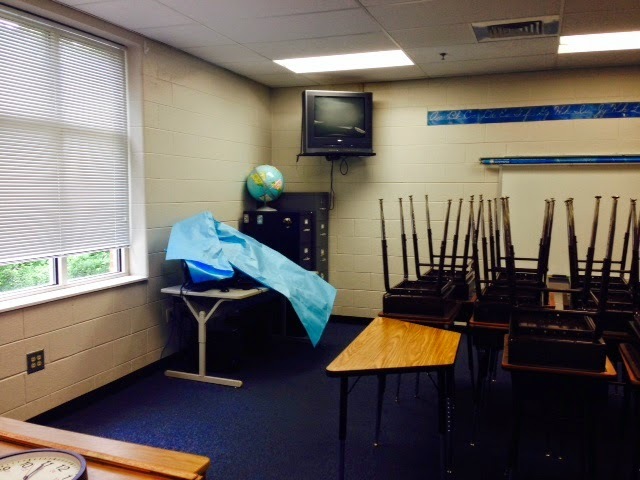 (I've only seen the front office & principal's office) What does my new classroom look like? Do I have a lot of storage? 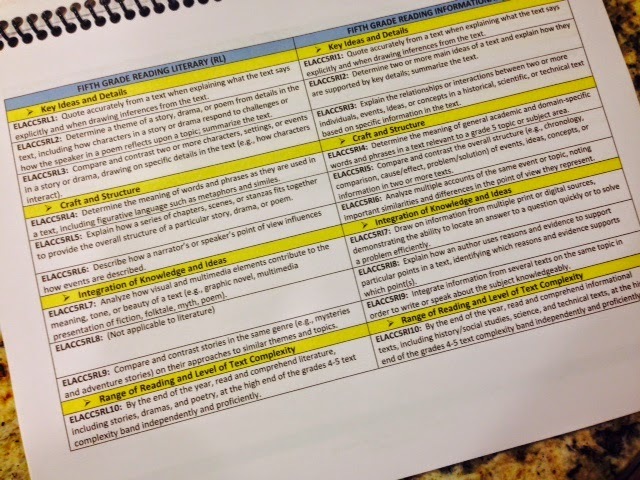 How do things work in 5th grade with the rotation of classes? Wanting: I got a new laptop for Mother's Day and I do love it, but it drives me BATTY with how touchy it is! Needing: MUST get back on track with Weight Watchers! 1. Enjoy little moments - I really want to soak up every moment with my son and enjoy doing fun things together. Fun things like water gun fights, playing outside, blowing bubbles, day trips to the aquarium, building sandcastles at the beach, etc. 2. Beach trips - I am so very excited to go to the beach this summer! It is my happy place! 3. 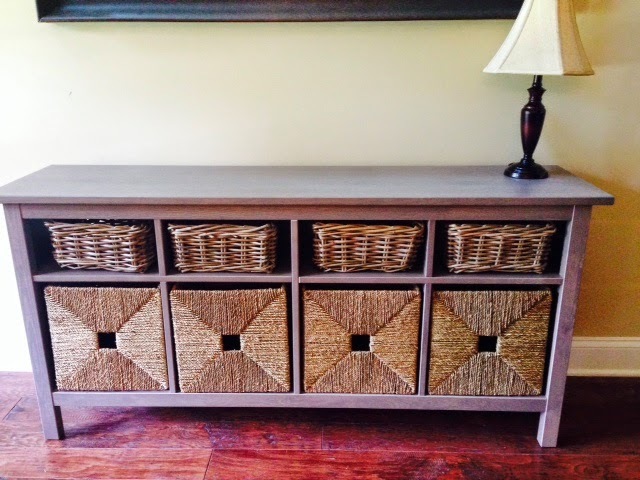 House projects - Having just recently moved into a new house, we have lots of house projects/organization going on so I am hoping to knock out a lot this summer!